One of Prague’s oldest and best preserved religious buildings within the Prague Castle complex is St George’s Basilica, Bazilika Sv. Jiri. Founded by Prince Vratislav I of Bohemia around 920, the Basilica is dedicated to St George and is the city’s most important Romanesque landmark. 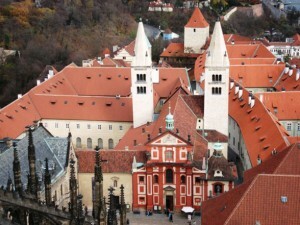 St. George’s Basilica ranks among the great monuments of Romanesque architecture in Bohemia. When the neighbouring St George’s Abbey was founded in 973, the Basilica was expanded to include the Abbey. Of the original 920 structure, only the foundations have been preserved. When a major fire destroyed the building in 1142, the reconstructed church took on a Romanesque appearance. The Baroque facade that we see today dates from the 17th century. The remains of Duchess Ludmila, Bohemia’s first martyr, were placed here in 925. In the first half of the 13th century, the St. Ludmila Chapel was added and her tomb placed there. Until 1055, the Basilica was the official resting place for the House of Premyslid. Several Czech princes of the Premyslid dynasty, including Prince Vratislav, are buried in the Basilica and their tombs can be seen in the main nave. Towering above the Basilica are the massive twin marlstone towers. The narrower tower to the north was once called Eve and the wider, southern tower Adam. The church portal on Jirska Street was built around 1520. Its tympanum shows St George fighting a dragon. Below this are the sandstone statues of Vratislaus I, the founder of the church, and Blessed Mlada, the founder of the Abbey. In the 17th century, the western side of the church was adapted in the Early Baroque style and acquired its brick-red facade. The Baroque Chapel of St John of Nepomuk was added between 1718-1722 upon the martyr’s beatification. A statue of St John of Nepomuk with angels is on the facade. St. George’s Basilica now serves as a concert hall for classical music concerts. 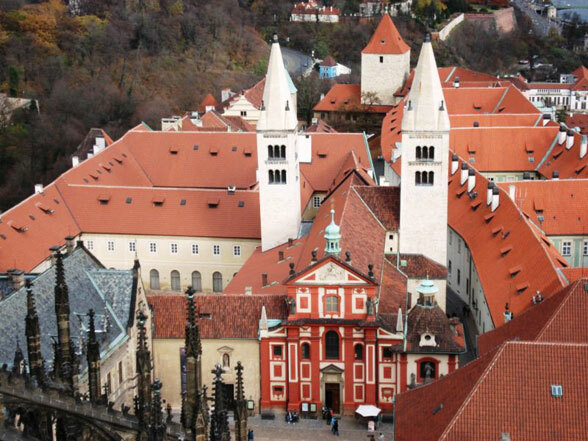 See what’s on at St George’s Basilica and you can also book your Prague concert tickets Here. Located in the centre of Prague, St George’s Basilica can be reached by Metro: Malostranska (Line A), then catch tram 22 or 23 to Prazsky Hrad. The post St George’s Basilica – An Important Landmark at Prague Castle appeared first on Czech Republic Travel.